DENVER ­— Thursday, July 14, 2011 — Gov. 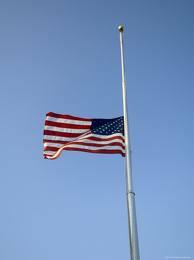 John Hickenlooper today ordered flags be lowered to half-staff on all public buildings statewide on Friday, July 15, in honor of Col. Leo S. Boston. Flags should be lowered from sunrise to sunset. Col. Boston was the pilot of an A1 Skyraider aircraft that was on a search-and-rescue mission in North Vietnam on April 29, 1966, when it was reported missing. Col. Boston’s status remained as missing until April 27, 1978, when his status was changed to presumed dead. His partial remains were later found and identified. Col. Boston was a native of Canon City. A funeral is scheduled for 1 p.m. Friday, July 15, at the U.S. Air Force Academy near Colorado Springs. Site contents copyright © 2019 Recorder Online	except as noted. All rights reserved. | 89 queries in 2.190 seconds.